We refined our list and expanded the guide on reverbs. Reverb has a very special place in the guitar community and music scene as a whole. It is one of the oldest effects ever used across just about every genre you can think of. What Makes It So Attractive? What Types Of Reverbs Are There? How To Use A Reverb Pedal Effectively? 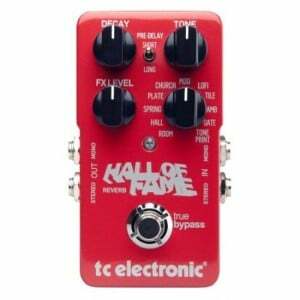 Today we are going to show you some of the best effects pedals from this category, which you can get right now. We have chosen a variety of flavors as well as price ranges, thus making sure that anyone can have access to a good reverb no matter what. More importantly, we want to use this opportunity to familiarize you with reverb as a guitar effect. Unique sounding reverb that offers a new take on this old effect. An agile pedal that brings more control over the tone than usual. Beloved classic that brings the same performance we fell in love with. Unique design that allows you to create customized reverb using TonePrint technology. Multi-effect pedal that defines the word 'versatility' in more ways than one. Great balance of price and performance makes DR600 a good budget option. Simple Boss unit that packs a number of practical and versatile features. One of the best reverb platforms available in terms of pure flexibility. Crazy amount of features packed in a budget friendly and capable package. 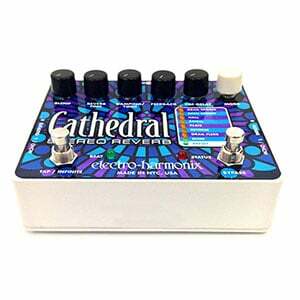 Among the most versatile pedals available, Cathedral Stereo is punching pretty high. Digitech Polara is one of those reverb pedals that gives you the core performance you would expect from an effect of this type but also goes an extra mile. We are talking about a high-quality stompbox, which features most of the controls you can see on standard reverbs, but some features which are unique to its design. Every single component is high quality, which makes for a consistent and reliable effect pedal. Versatile, built like a tank, Digitech Polara Lexicon Reverbs Stereo Pedal (click for full review) is by far one of the most refined models in its category. True bypass comes as standard, and the number of reverb options is truly impressive. You have the legendary Spring reverb at your disposal, as well as some of the more modern options. By this, we mean Halo and Reverse settings. While it definitely isn’t among the most affordable reverbs out there, this DigiTech design is well worth the investment you are expected to make. Those who are looking for complexity and absolute control over their effect pedals will undoubtedly appreciate what this Mooer design has to offer. This is a ‘2 in 1’ deal that incorporates a shimmer and reverb effect into one solid pedal. One look at the control cluster reveals just what kind of fidelity you can expect. The lower portion is reserved for two footswitches – each for one of two available effects. It’s a busy stompbox, that’s for sure. However, the versatility it offers is hard to top, and the tone quality is definitely on a high level. 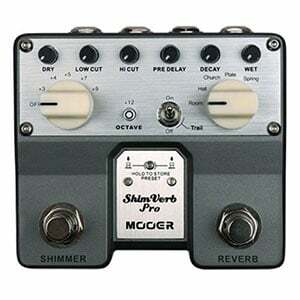 Depending on how serious you are about your reverb, Mooer TVR1 Shimverb Pro (click for full review) can be a real force multiplier if used correctly. After all, Mooer is one name you can trust to deliver high-end stuff that might look complicated but is actually as functional as they come. Ultimate control is what this pedal is all about. Those who are looking for these qualities will understand what kind of animal Shimverb Pro is. This is a special edition by Boss, for one main reason, they’ve collaborated with Fender to design the FRV-1 (click for full review), a dominant manufacturer of guitars which everyone should have at least heard of by now.This pedal is an enhanced remake of its old classic release, the manufacturers have kept everything people loved in the original release, while adding more quality. Featuring classic Reverb controls. Dwell, Mix and Tone offer refinement of your sound trail – ranging from intensity of the effect, to choice on how much Reverb you want blended in with your original sound. This Vintage beauty delivers a sound output that will fascinate everyone in close proximity. Its quality is exactly what you can expect just from taking a look at the brand names responsible for its creation. If you are just starting out and want to get something unique, or you want to add another magnificent addition on your board, this pedal will thrill you, you can’t find anything quite like it elsewhere. The HOF mini (click for full review) is either a one-trick pony or one of the most versatile pedals you’ll ever come across. The front side of the chassis features one button for foot-smashing, and the other for Reverb tuning. Thanks to TC’s TonePrint technology, it can get become so much more. TonePrint is a software that enables forgery of original and unique sounds, all the options are there and it’s up to you what you can come up with. Design your sound on your computer/laptop, import it into the pedal via USB and get ready to witness groundbreaking technology. If you’re looking to get this pedal as a first in your arsenal, then don’t worry at all, you can keep it simple with the offered Reverb dial as it offers high-quality effects which you can tune to your liking. This astonishing “stomp-box” by TC covers guitarist’s needs who possess different ranges of experience, all available at a fantastic startup price. If there’s one attribute you can always attach to Zoom’s products, it’s versatility. Same goes for the MS-70CDR (click for full review). This is a full blown guitar effect processor compressed into a standard size stompbox. While it packs some 80+ effects in total, we are mostly interested in its reverb. With that in mind, the quality of said effect is satisfactory, to say the least. You maybe won’t see the same level of refinement as you would in some stand-alone models, however its reverb comes across as fairly organic. On top of that, you are presented with several decent options. All of that aside, the real value of this Zoom comes from its ability to combine up to 6 effects at any given time. That layering of effects enables you to further refine the reverb and shape it any way you want. If you are in the type of music where you need to go from one end of the spectrum to another during a single performance, versatility this pedal offers becomes invaluable. Behringer was always known as the patron saint of budget musicians, especially guitar players. Their pedals are rough around the edges, but the core performance is almost always on point. Behringer DR600 (click for full review) is their take on a versatile, yet affordable reverb stompbox that you can get without breaking your bank account. Pedals that fit this description usually end up being more of a problem than anything else, but that’s not the case with Behringer. We get rudimentary but functional controls, which allow you to dial in a decent variety of reverb effects. Same goes for shaping said reverb. You have a certain amount of maneuvering space to work with, which might not seem like a lite when you put this thing next to a boutique model. However, when placed in proper context, you will be hard-pressed to find a better reverb than this one. If you are on a very tight budget simply have to have a reverb in your signal chain, Behringer DR600 is the only viable option. They say that the secret of success behind Boss pedals is their uniformity. This might be true. However, the quality they deliver is also a huge factor. Boss RV5 Digital reverb (click for full review) is one of the most reasonably priced and well-rounded pedals of this type that you can get at the moment. In standard Boss fashion, you get a set of four no-nonsense controls and a footswitch that is as durable as the case it’s installed in. However, none of this means anything if the reverb effect isn’t up to the expected level. Fortunately for us, Boss didn’t disappoint with this one. You get a reverb effect that is in that sweet spot when it comes to versatility and quality. That type of combination is exactly what most guitar players are after. 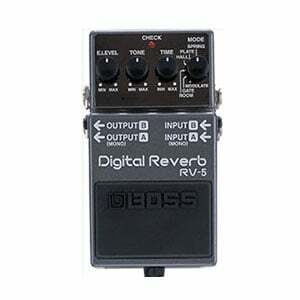 With that said, those looking for a more refined reverb on a budget might find a great solution in this Boss. It has that little extra headroom for tone tweaking, which you rarely find these days. If you want to be on the very edge of modern guitar effects, TC Electronics is one brand that can give you that type of experience. Their HOF Signal Path pedal (click for full review) is a true masterpiece of modern technology, which brings a decent insight into what the pedals of tomorrow might look like. Let’s put it in simple terms. You get a reverb that packs some 10 presets which include all your popular versions of this effect and then some. These can, of course, be tweaked to a very generous extent using available controls. However, that is only one part of the deal. TC Electronics implemented their TonePrint technology into this stompbox. TonePring allows you to import your own presets, which you previously design using a piece or proprietary software. Such a configuration of features and controls ensures borderline endless possibilities. None of that matters much if the quality of tone itself isn’t on par. In this case, you definitely don’t have to worry about that. 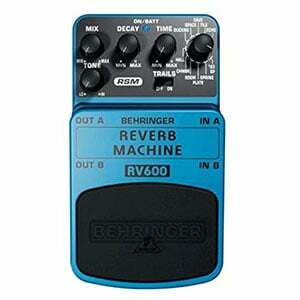 We have already covered one Behringer reverb, which was the epitome of affordable and functional simplicity. However, this brand has a couple more aces up their sleeve, including the more advanced RV600 (click for full review). What this pedal offers is a significantly more versatile solution that brings you additional flexibility at a bargain price. Controls available are extensive, but pretty straight forward and the quality of the entire package defies logic when you consider the price. In terms of budget reverbs, this one is among the best you can find at the moment. Behringer keeps pushing the line further and further by delivering quality and versatility to those who are limited financially. Maybe it’s not the type of reverb you’d use for a large concert, but it sure is an awesome tool for gigging and practice. At the end of the day, the best thing about this pedal is the fact it gives a versatile option to those whose budget limits them to compromises only. That is something you have to respect. It wouldn’t be a top list without an addition from EH. This versatile masterpiece offers much more than your regular pedal, with a plethora of options it provides sound refinement like no other. The more you get to know how this pedal works, the more your sound quality will rise accordingly without an end in sight. It’s a continuously thrilling feeling. Among other quality traits, the pedal features 8 Reverb modes, of which the main highlights are the Grail Flerb, Grail Spring, Accu Spring and Reverse. What makes it truly stand out is the infinite Reverb this pedal provides. If you’re looking to get an all-around “stomp-box” featuring everything you ever wanted with remarkable sound output, this work of art by EH is designed to make you never think about getting another Reverb pedal. It can fit in any form of setup, and it is destined to conquer your flavor. Reverb is a sound effect used both in music and audio engineering, which adds a spatial dimension to the original track. To put it into more simple terms, a reverb gives you an impression that the sound is originating in a large room. You are hearing the source sound but also its numerous iterations as it bounces off different surfaces. Reverb guitar effects pedals offer a simulation of this phenomenon. With that said, it’s important to make a distinction between reverb pedals and echo pedals. These two are often time a source of major confusion. Here’s the deal. Reverb is similar to an echo in a sense that you are hearing the sound as it bounces off a surface. However, reverb is fairly quick and happens almost instantly. Echo effect, on the other hand, takes much longer to reach back to the user. One way to understand the difference is to yell in a smaller room, and then go out and yell in a canyon. Similar goes for delays. If you want to learn more about delay pedals, check out our dedicated guide here. Even though recorded sound traces back to late 1877, the widespread access to this technology has only become available some 60 years later. As we go back in time, reaching 1940s, we run into the first ever instance of reverberation being used in music recording. It didn’t really take long for this trend to become popular, spreading throughout the world. However, back then there were no effects pedals or anything similar. Devices we have today were science fiction at best. Old school producers had to resort to various other means to achieve the reverb effect. One of the first successful methods was to record a track as you would any other. Then you would take the recording and play it through a speaker that is placed in a very large room. The magic happens when you put a microphone somewhere in that room to essentially record the sound of a recording. However, by placing that speaker in a large room, they have added a layer of natural reverb. Due to the ever rising popularity of reverb, it didn’t take long for companies to figure out how to recreate the effect in early guitar amps. Have you ever heard of Spring Reverb or Plate Reverb? While to you these are just labels on a knob, back then these were real analog devices built into amplifiers. Needless to say, we have come a long way from using complex mechanical contraptions to create decent reverb. To answer this question, all you need to do is close your eyes and focus on what is currently going on around you. Just about every sound you hear, whether you are at home or on a busy street, is packed with some dose of reverb. In nature, sound reflects off of multiple objects and surfaces across various distances. Both our ears and our brains are used to reverb by default. That is one of the reasons why even an artificial reverb effect tends to make a track more enjoyable. Naturally, it all comes down to manipulating the effect to fit the occasion. There is definitely such a thing as too much reverb or not enough. However, this is the type of thing you will have to figure out on case to case basis. With that said, you would be surprised at just how often reverb is used in music these days. Some sound engineers and producers like to be subtle to a point where you won’t notice the reverb unless you are actively looking for it. Others tend to go overboard in order to express themselves. Back in the day when first amps with built in reverbs hit the markets, you only had one or two types of this effect to choose from. These days, things are a bit different. Two of the most popular types of reverbs are plate and spring reverbs. The latter is the original built in effect, while the former represents a more advanced evolution. Original plate reverbs were mechanical in nature. There was a literal plate inside the amplifier, which would transform input signal into vibration. Then you would have a pickup located somewhere near the plate, that recorded those vibrations. Today, such a contraption comes across as relatively crude, but many still love the unique mechanical sound it produces. Spring reverb uses a pretty much exact same principle, only this time you have a spring in there instead of a plate. The biggest improvement a spring reverb offers is reduction in both weight and size of the device. More modern types of reverb include hall reverbs, and all kinds of other emulations. A modern reverb unit, which is often digital, relies on various algorithms to emulate different spaces. Even so, most guitar players still prefer one of the original two. One of the more common questions beginners have is why even bother with reverb pedals when most modern amps have a built-in version of this effect? To be honest, if you have a vintage tube amp with an actual spring reverb inside, there really isn’t a good reason to go with a pedal. However, most don’t. The thing that makes reverb pedals a much better solution in most cases is that you get a level of quality that can be used on stage. Once you start getting into reverb, it won’t be long before you start noticing different nuances of this effect. A good portion of digital reverbs sound too sterile, while some analog can be too narrow in range. Finding that perfect type of reverberation matters if you are serious about building your guitar tone properly. Built in reverbs you usually see in lower quality amps are good for home practice and not much more. That isn’t to say that the added value of them being available in the first place is a bad thing. No, but you can’t really rely on those reverbs to get you anywhere serious. On top of that, a good analog reverb pedal is a one time purchase. Using a reverb effect is a form of art, as cliche as that sounds. Everyone has their own way of doing things, which is normal considering that different people have different taste. Even so, we can boil everything down to several rules which most of the community can agree upon. The very first one is that moderation is your best friend. You will definitely want to start slow, with an almost completely dry signal, and start adding some reverb bit by bit. Depending on the type of music you are making, that subtle hint of reverb may be all it takes to get the point across and make that track sound more organic. If you want to take things a bit further, recording a completely dry track and then mixing it with the very same section with added reverb can yield some pretty interesting results. As you have probably noticed by now, experimentation is the key here. The most important thing is to start slow. Another piece of advice most experienced guitar players will give you is to keep your reverb pedals near the end of your signal chain. The reason for this is simple but requires a more colorful explanation. Imagine your signal chain as a conveyor belt for ice cream. As the signal leaves your guitar, it is just a plain vanilla mass that gets another layer of flavor as it hits different pedals. Distortion might add a nice chocolate glazing, then we have the modulation with its meticulous icing, and so forth. A reverb pedal in this context are sprinkles. You don’t want to add them at the beginning since they can completely change the way every other ingredient that comes afterward behaves. You add sprinkles at the end. In appropriate amounts only. This general tip applies to all so-called temporal effects. Anything that messes with the timing of the signal should come last. If you were to put reverb before distortion, which is often one of the first effects in a chain, that distortion would be applied to both the original signal and all of the echoes. In other words, you’d get a mess. Naturally, this isn’t a rule written in stone. There are always exceptions. However, it is best to start with reverb at the end as this is the most neutral position. Reverb pedals come with all kinds of different layouts. Even so, some of the controls are virtually universal. The first one we would like to mention is the dry/wet knob. This control is what you use to mix your original signal and the effect itself. When the knob is turned all the way to dry, there will be zero reverb present in the signal. As you move towards wet, the amount of reverb increases. Next important control knob is usually labeled as time or rate. This defines the length of echoes in a reverb. You can have them short or you can have them last for a fairly long time. Which side you will lean more towards is going to depend on the nature and tempo of your music. Slower, more subtle riffs can easily deal with long reverb times while faster sections usually work best with short reverb. Again, experimentation is the key here. Reverb is one of the most popular guitar effects in use. It’s so subtle, natural and valuable that it can easily turn a mediocre track into something more profound. The pedals we have listed above are by far some of the best you can get at the moment. They are not all the same, and each offers its own take on reverb in general. However, all of them will serve you more than well in your search for that tasty reverberation. Lastly, we hope that this guide has helped to clear up some misconceptions about reverbs you might have had.